This item is made of quality material with fine process, it's lightweight, portable, durable, waterproof, resistant to high and low temperature. The screen is luminous and clearly display the time, speed, distance, etc. This item is perfect for riding lovers. 1. This odometer is only rainproof! Don't dip it in water. 2. Please don't miss the waterproof sealing ring in the battery compartment. 3. Please keep the distance between magnetic senor and transmitter below 2mm. BRIGHT BACKLIGHT: Keep the LED backlight on a long time, makes the display readable all the time when in low light conditions, perfect for night riding. 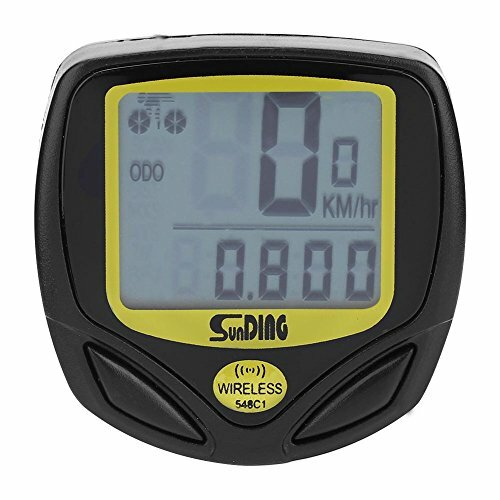 MULTI-FUNCTION: It's multifunctional, it can show you data of speed, distance, time, current temperature, etc. WIRELESS WATERPROOF DESIGN: The bike computer can record the data accurately. you can use this water-resistant bike computer even in the rainy days, just wipe it dry when cycling or finish your journey. LONG WORKING TIME: Powered by one CR2032 battery, energy-saving deisgn can offer you a long working endurance. GUARANTEE: If you are not satisfied with our product received, you can apply for unconditional return and refund within 180 days. In terms of any problem of this product, you can send emails to us at any time. We will reply you as soon.